One of the most frustrating aspects of having OCD (besides actually having OCD and dealing with it constantly) is trying to talk to people about it. 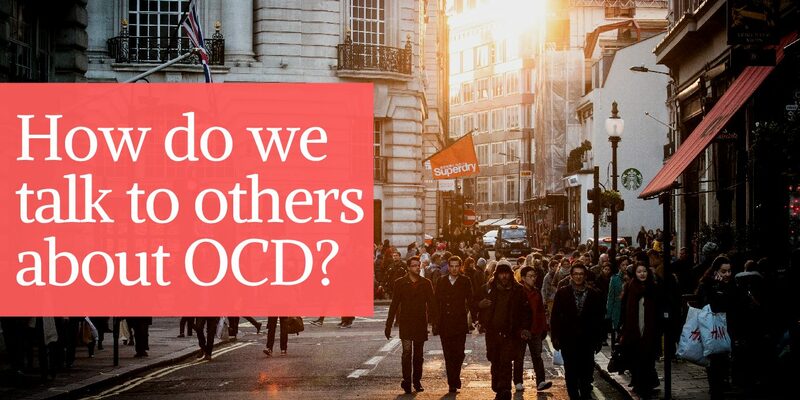 This is probably why most people don’t tell others about their obsessive compulsive disorder. Instead, we usually keep it quiet. We don’t bring it up. We try to manage on our own or seclude ourselves so we don’t have to deal with other people. I have done both! Even having this blog and being fairly transparent about having OCD, I don’t bring it up too much. However, there are times when it comes up or you choose to bring it up. Say “obsessive compulsive disorder” instead of OCD. When people say “Oh, I’m OCD too!” avoid sighing audibly and shaking your head. But really, what should we do? Some people may very well have OCD who say this (although if they really do have OCD, they might instead say “Oh, I have OCD too.”). You might ask someone who says this, “Oh really? What kind of compulsions do you do?” Their answer will hopefully tell you if they actually have OCD or are just associating themselves with what most people unfortunately classify as OCD (that isn’t actually obsessive compulsive disorder). If someone says they are a little OCD, take the opportunity to gently educate them. People need to realize that mental illnesses are not a choice! This is something that can be incredibly frustrating because usually the people are well meaning and trying to help. They may say, “I know you can do it! You just need to think positively! You’re a good person” but to you, it might feel like they are saying “You aren’t being good enough and you are a lazy person if you have this problem.” These people need to be gently educated on the reality of how mental illnesses work so that they stop saying things like this to other people. And then end the conversation. You don’t need that kind of negativity and bravado in your life. Unfortunately OCD isn’t like a cold. We don’t really magically “get better” after a certain period of time, though the OCD can get beaten back indefinitely through cognitive behavioral therapy and other methods of treatment. People asking if you are better are probably really wanting an update on how things are going but don’t know how to ask that in a “nice” way. Do you have any tips that have worked well for you when talking to people about your OCD? I’d love to hear them!